Today's adventure began a smidge threatening. Dark clouds loomed and a forecast for intermittent rain made us wary. We met at the end of Eagle Ledge Road on the outskirts of Worcester and before we could say hooray, it began to rain. 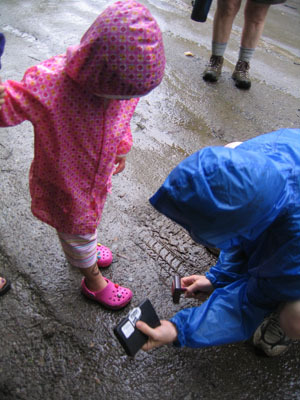 Sage jumped into a pink raincoat, got her leg ceremoniously stamped with the YAC "Official Adventure" stamp, and was swept away to the safety of the dry car. Lexi, Rick, and I figured that a little rain never hurt, so we went for the walk. Sure enough, before five minutes had passed, the rain stopped and it cleared up. It remained really humid, but we had a fine time checking out the wildflowers. Linnaea conked out in the pack on the return. This walk is really flat and could make for a nice cross country ski adventure.